John Muir flattened fear, built an international business and succeeded against the odds. This book is about John Muir’s life and how he winched the world from down under. 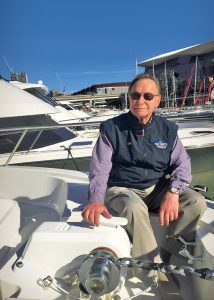 From humble beginnings in a simple shed at his father’s boatyard in Battery Point, Tasmania, to international recognition amongst the builders and owners of an amazing array of sea-going around the world. His winches are renowned for their quality and him for his inspirational work ethic. This book details the family, friends, employees, and colleagues that formed the basis of his success.